Step 1: Immerse the wheat in a water bath. Any pest, infected wheat should float and should be removed. Step 2: Overnight soaking in a strainer. The volume of wheat should also grow by 50% in the process. If you can crush the grain between your fingers then the wheat is adequately soaked. Step 3: Put your soaked wheat in the sprouting basket. An ideal sprouting tray would have a lid to keep mold and pest away, perforated base to drain excess water and ensure a healthy air supply. To get the optimal yield you need to ensure uniform sprouting, which means in spite of bulk quantity, all grains should get uniform temperature, air and light. Try tasting the wheat, it should be soft and sweet. Step 4: Wait till the spouts are there. 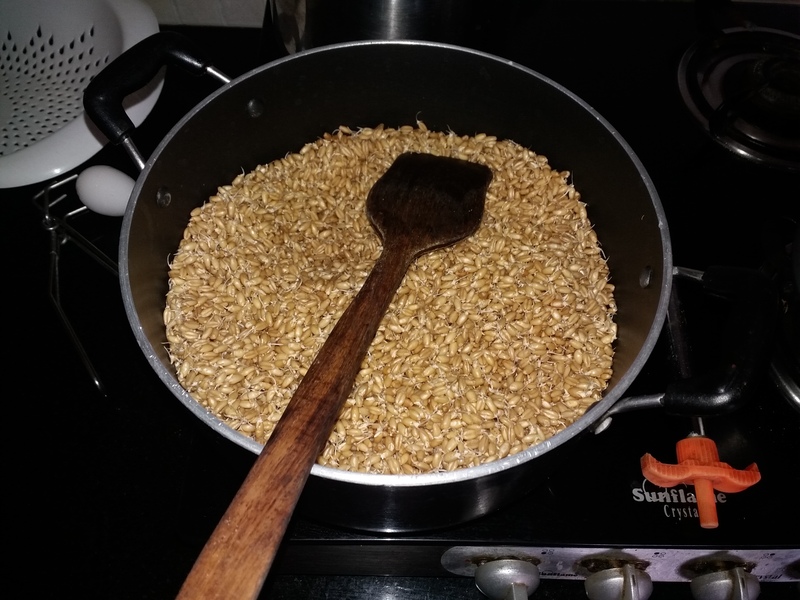 You know the sprouting is complete when two germs are visible and the length of the longer germ is equal to 1/2 of the grain length (as seen in photo). Waiting too long will lead to loss in malt weight as the sprout will start feeding over the starch. Waiting too little will lead to incomplete enzyme action. 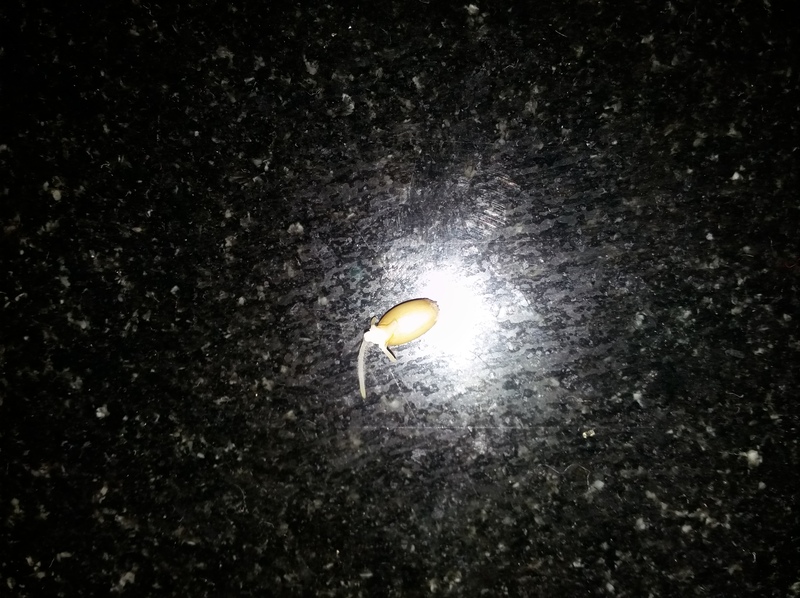 Step 5: Stopping the germination. 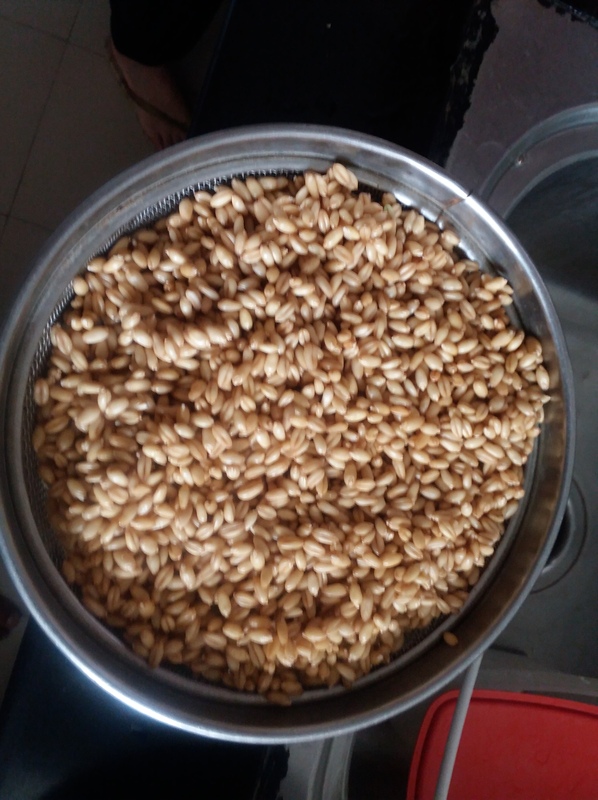 You could do it by drying it strong sunlight, freezing the malt which leads to bursting of cells and releasing the sugars and enzyme for good action. Industrial batches can be lightly roasted to achieve the same. Step 6: Crush the dried grain between the fingers to remove the sprouts. It contains no ferment-able sugar and most of the protein. hence removing this will greatly improve your wort efficiency. Step 7: Say hello to grunt work. 2 Hours of roasting with enough churning to ensure uniform caramalization of sugars. If the wheat starts making cracking noise, add a little water to ensure darker caramels without risking burnt grain. I typically watch a nice bollywood movie alongside this process. Step 8: Break your malt into three lots. a) lightly roasted cracked wheat malt which is ideal for light beers. It also makes an excellent porridge which is healthier than the market Daliya/broken wheat. 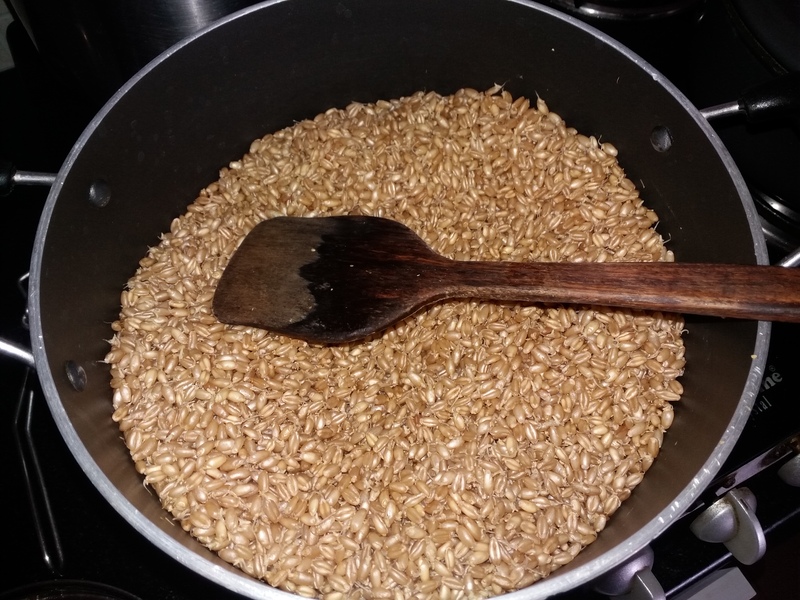 b) Medium roasted malt great for most recipes. 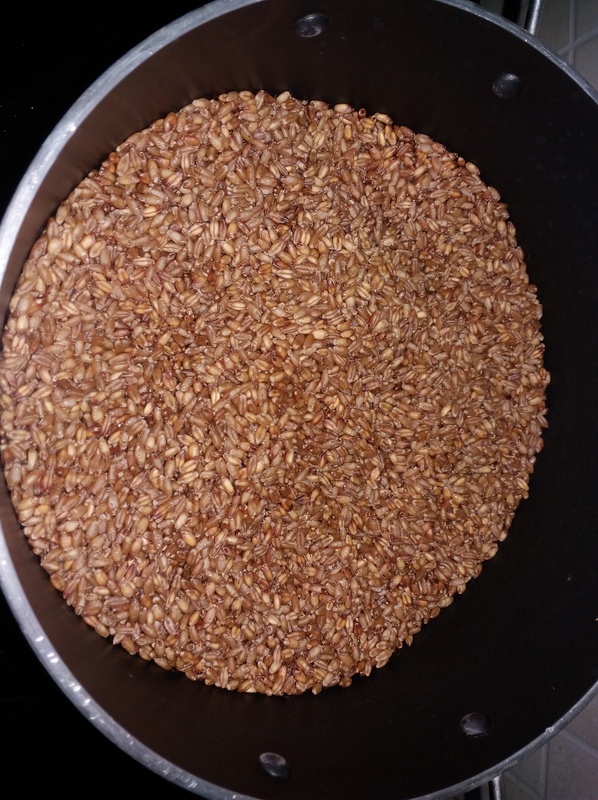 c) Dark caramelized wheat malt for stout beer. 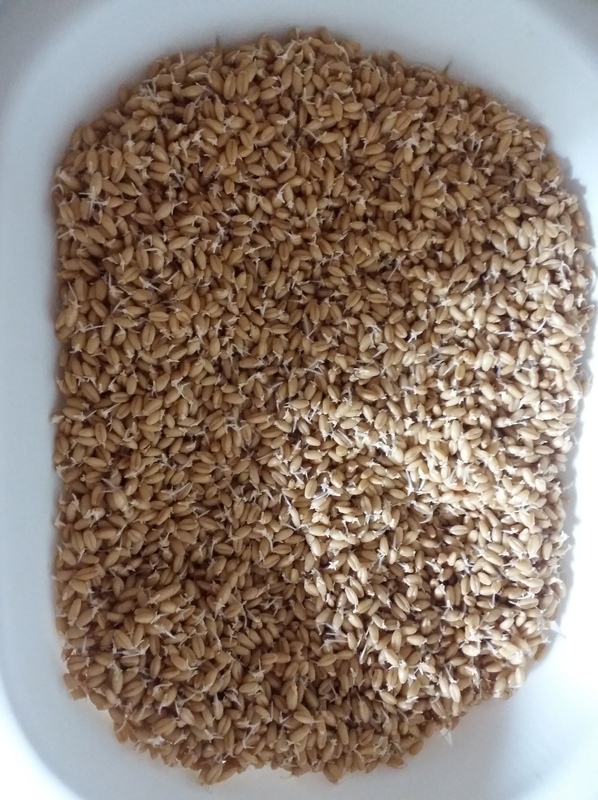 Step 9: Aerate: Apart from the malty flavor this grain will have a lot of foul smells and storing it in paper bag for 2 weeks helps reduce the unwanted odor and retain the pureness of nature. Step 11: When you boil it into a wort use a few drops in a refractrometer to guage when to stop. A hydrometer is cheaper but you need to cool 50ml every time you take a reading. “He is a self-made man and worships his creator.” – John Bright. “He has no enemies, but is intensely disliked by his friends..” – Oscar Wilde. “I am enclosing two tickets to the first night of my new play; bring a friend, if you have one.” – George Bernard Shaw to Winston Churchill. “Cannot possibly attend first night, will attend second … if there is one.” – Winston Churchill, in response. “I feel so miserable without you; it’s almost like having you here.” -Stephen Bishop. “I’ve just learned about his illness. Let’s hope it’s nothing trivial.” – Irvin S. Cobb. “He is not only dull himself; he is the cause of dullness in others.” – Samuel Johnson. “He loves nature in spite of what it did to him.” – Forrest Tucker. “Why do you sit there looking like an envelope without any address on it?” – Mark Twain. “His mother should have thrown him away and kept the stork..” – Mae West. “Some cause happiness wherever they go; others whenever they go.” – Oscar Wilde. I am really sorry if I hurt your feelings by calling you stupid. I really thought you already knew that. I was hoping for a battle of wits, but you are apparently unarmed. You are the kind of guy to take to the cinema when I want to watch the movie. A conversation between a drunk man and the American poet, Dorothy Parker: Drunk man-I can’t bear fools. Parker- Apparently your mother could.